I was privileged to attend the exhibition while it was at the Peabody Essex Museum in Salem, Massachusetts (and will seriously shill for this institution overall, which remains the reason to visit Salem, witchcraft tourism be damned. That and the town is topheavy in good restaurants and coffee shops. )The exhibition was a glorious experience, filled with artifacts which may never tour North America again. I was constitutionally incapable of leaving without the accompanying volume. It was a very wise purchase.The book is divided into sections: the Qianglong Emperor in a historical context; the background and theory of this style of garden design; details of both the artifacts and the garden itself, including the follow-through from the Empire into the People's Republic; and the techniques of artistry and conservation.The subject matter tended towards the dry, but a dryness of richness of information and not an enumeration of objects. 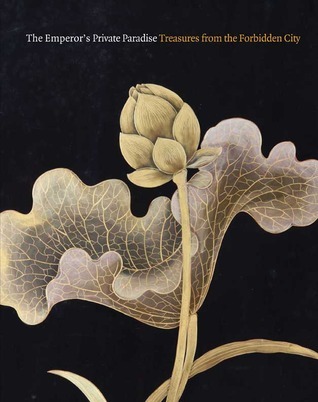 This book takes a look at the Qianlong Gardens found in the forbidden city. The forbidden city has been open to the public since 1925. However, the gardens in this winter palace have not been viewed by tourists. An exhibit was arranged with international collaborators with over 90 objects that have not been seen before. It has had a limited tour including New York's Metropolitan Museum of Art and the Milwaukee Art Museum. The restoration of these works and other objects should be available for viewing in China by 2019, being funded by the Palace Museum and the World Monuments Fund.The book contains beautiful, color, full page plates, as well as a chronology of Chinese History and maps. A glimpse of emperor's collection.